For the illuminated Gospel book, see Codex Aureus of Lorsch. The Lorsch Codex (Chronicon Laureshamense, Lorscher Codex, Codex Laureshamensis) is an important historical document created between about 1175 to 1195 AD in the Monastery of Saint Nazarius in Lorsch, Germany. It consists of 460 pages in large format containing more than 3800 entries. It is important because it details the gifts given to the monastery and the possessions belonging to it, which thus gives some of the first mention of cities of the Middle Ages in central Germany, and in particular in the Rhein-Neckar region. Over one thousand places are named. No original of the Lorsch Codex is known; however, the Bavarian state archive is where the codex is housed today. 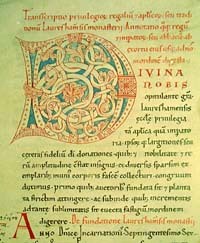 The codex as it exists now is handwritten in Carolingian minuscule, and an illuminated initial – a huge "D" – is on the first page. This page was last edited on 23 June 2017, at 22:07 (UTC).